Smart Wires mobile deployment of power flow control helps utilities get critical reconductoring, construction and maintenance projects done on time and on budget. This tool enables and extend outage windows and reduces the number of “no touch” days and crew remobilizations. This means utilities can get their work done safer, easier and faster. Taking an outage to do work on a line can often cause problems (e.g. overloads) elsewhere on the grid, preventing utilities from securing a sufficiently long outage. Smart Wires mobile solution can be temporarily deployed on overloaded lines to increase the circuit’s impedance and push power to less-utilized lines. This resolves the overload and gives the utility more time to do work. This mobile trailer leverages Smart Wires proven power flow control technology in a unit optimized for rapid, 8-hour installation and easy redeployment. 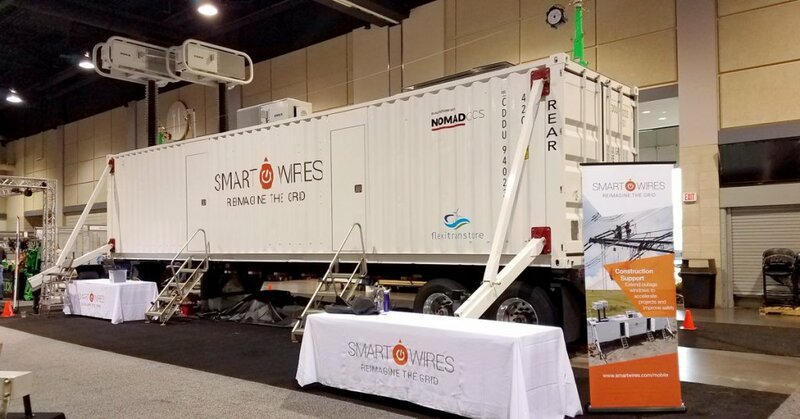 Smart Wires recently exhibited at the 2018 International Lineman’s Expo. If you were not able to walk inside the demonstration trailer, visit the Web site to view videos of the technology in action.